Leeds to London bike ride success! 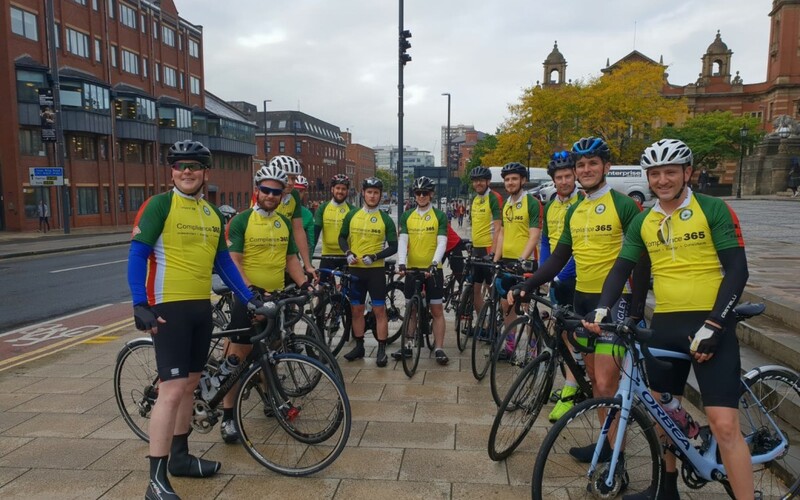 On Saturday 15th September, 16 friends undertook a 245 mile bike ride from Leeds to London to raise money for the Great North and Yorkshire Air Ambulance services. The cyclists covered 245 miles over 23 hours and 45 minutes, arriving at the finish line 15 minutes ahead of their 24-hour target (just in time for a much-deserved pub stop!). The bike ride was completed in order to raise money towards both the Great North and Yorkshire Ambulance services who have selflessly come to the riders’ aid in the past, subsequently saving the lives of some. The cyclists commenced the bike ride at Leeds Town Hall at 12pm on Saturday, arriving at the Churchill Memorial in Parliament Square, London at 11.45am on Sunday. They also had the opportunity to complete a lap at Donington Park and Silverstone Circuit. So far, a whopping £12,000 has been raised for the Great North and Yorkshire Air Ambulance services. Did you know that £12,000 is enough to keep a Yorkshire Air Ambulance in the air for a day? !